Shell Foundation Faculty Fellowship, 1982. Alfred P. Sloan Foundation Research Fellowship, 1984. James B. Macelwane Medal (American Geophysical Union), 1989. Best Paper Award, GSA's Div. of Structural Geology & Tectonics, 1990. Birch Lecturer, Tectonophysics Section, AGU. 1998. Original Member, Highly Cited Researchers, ISI/Thompson Scientific, 2002. Arthur L. Day Medal (Geological Society of America), 2002. Lecturer, Crafoord Prize Symposium, 2002. Quantitative Tectonics: Applications to regional and global tectonics of investigations of the horizontal kinematics of the crust and lithosphere inferred mainly from marine-geophysical, paleomagnetic, space geodetic, and earthquake-mechanism data. Analytical, numerical, and laboratory modeling of lithosphere deformation. Plate rigidity and wide plate boundary zones: Using marine geophysical and space geodetic data, students, colleagues and I have been placing quantitative limits on plate rigidity and identifying regions of the world where plates deform over very wide zones, which we interpret as diffuse plate boundaries. 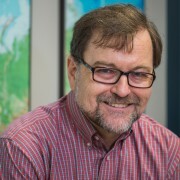 Current work includes a collaboration with Professor Gregory Houseman (University of Leeds) in applying the thin viscous sheet model to deformation of oceanic lithosphere in the Indian Ocean. Another recent direction of research with graduate students and with Professor Corné Kreemer (University of Nevada) has been efforts to quantify the magnitude of horizontal thermal contraction and its effect on plate-circuit non-closures and deviations in the azimuths of transform faults. Tectonic paleomagnetism: My graduate students and I are analyzing the shapes of sea-surface magnetic anomalies due to seafloor spreading. From this information we estimate paleomagnetic poles averaged over small, precisely dated time intervals. Goals of this work include testing circum-Pacific plate reconstructions, determining the history of motion of hotspots relative to the paleomagnetic axis, and to put bounds on possible persistent quadrupole components of the geomagnetic field in the past. Absolute plate motions: Current studies include a global model of current plate motion relative to the hotspots, a global model of absolute plate motion inferred from the orientation of seismic anisotropy determined from shear-wave splitting, implications for the tectonic and volcanic evolution of the Pacific, tests for motion between hotspots, and estimates of true polar wander. Tectonic applications of space geodesy: Motion between the Pacific, North America, Eurasian, and Sierra-Nevada plates over recent decadse using geodetic data from very long baseline interferometry and the global positioning system. One focus has been how motion is accommodated across the wide deforming zone in western North America that divides the Pacific from the North American plate. Mishra, JK & Gordon RG, The rigid-plate and shrinking-plate hypotheses: Implications for the azimuths of transform faults, Tectonics, 2016. Gordon, R. G., D. F. Argus, & J.-Y. Royer "Space geodetic test of kinematic models for the Indo-Australian composite plate." Geology, 36 (2008): 827-830. David L. Andrews, Richard G. Gordon & Benjamin C. Horner-Johnson "Uncertainties in plate reconstructions relative to the hotspots; Pacific-hotspot rotations and uncertainties for the past 68 million years." Geophysical Journal International, 166 (2006): 939-951. Jellinek, MA, Gordon RG, Zatman, S "Experimental tests of simple models for the dynamics of diffuse oceanic plate boundaries." Geophysical Journal International, 164 (2006): 624-632. Horner-Johnson B.C., Gordon R.G., Cowles S.M., Argus D.F. "The angular velocity of Nubia relative to Somalia and the location of the Nubia-Somalia-Antarctica triple junction." Geophysical Journal International, 162 (2005): 221-238 . DeMets C, Gordon R.G., Royer J.Y. "Motion between the Indian, Capricorn and Somalian plates since 20 Ma: implications for the timing and magnitude of distributed lithospheric deformation in the equatorial Indian ocean ." Geophysical Journal International, 161 (2005): 445-468 . Zatman S., Gordon R.G., Mutnuri K. "Dynamics of diffuse oceanic plate boundaries: insensitivity to rheology." Geophysical Journal International, 162 (2005): 239-248 . B. J. Horner-Johnson, Gordon, R. G. "Equatorial Pacific magnetic anomalies identified from vector aeromagnetic data." Geophysical Journal International, 155 (2003): 547-556. Gripp, A. E. and Gordon, R. G. "Young tracks of hotspots and current plate velocities." Geophysical Journal International, 150 (2002): 321-361. Zatman, S., R. G. Gordon, and M. A. Richards "Analytic models for the dynamics of diffuse oceanic plate boundaries." Geophysical Journal International, 145 (2001): 145-156.